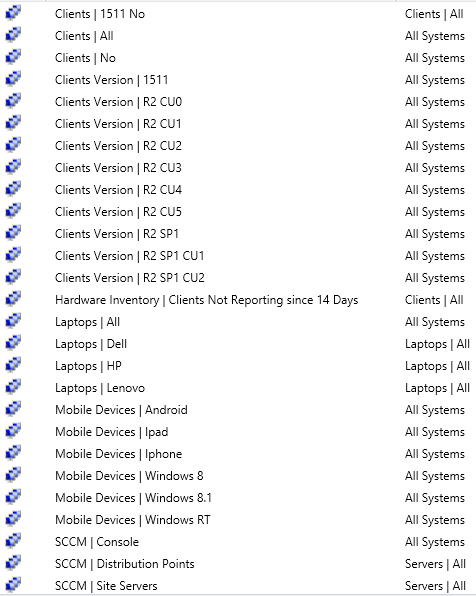 With time I built a set of “Default” query for device collections that I create right after the initial SCCM setup. This set of collection usually covers 95% of the initial client needs. I’ve built a PowerShell script so the effort to create 56 collections is near to none. 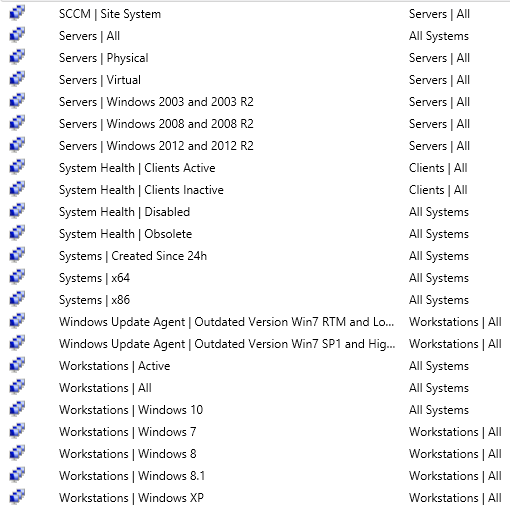 By running the Powershell script, you’ll end up having 56 collections in a Operational folder. The collections are set to refresh on a 7 days schedule. Note : The collection name must be unique in SCCM so if you already have a collection with the same name, the script will give an error on this particular collection but will continue to process other collections. Tip : You can comment out any collections that you don’t want using (#) at the begging of the “New/Add-CMCollection” lines in the “Create Collection” Section. Be sure to rate the submission is you are using it. Thanks ! ***Update 2016-08-08 – Addition of 6 new collections. ***Update 2016-02-16 – Complete revamp of all the collections names and addition of 3 new collections. This substance is composed exceptionally well about explaining how to strengthen security and separate Intune with Configuration Manager infrastructure in SCCM console. Your utilization of organizing when mentioning your focuses makes your objective facts clear and straightforward. Much obliged to you. Just wanted to let you know that I have used your collection/queries to create a Gui application. I wanted to be more flexible on the features, that is the reason. Of course credit is yours for the collections. Here is my application if you want to have a look: https://gallery.technet.microsoft.com/SCCM-Collection-Creator-3db734fc. If I have the names of hosts on which I need to install a package, how would I go about it using PS (Did not find any such option in GUI)? Just to be more clear on query, I’ve a list of Win10 hosts on which I need to deploy a package. These set of hosts are among a larger set of Win10 hosts and have difference only in terms of custom environment variables. I did not find a way to capture environment variables using custom query in GUI and hoping PS may have some answer to this. This script doesn’t work right with SCCM 1511. (console/site version of 5.00.8325.1000). And none of those can be deleted. This just causes the process to not continue. What are your thoughts on moving this to GitHub to allow community contributions? Benoit, I downloaded the script from technet today. Used on a newly deployed lab, but got an error trying to create the collections. It appears that you are trying to create collection 53 and collection 68 with the same name but diff query. I changed my downloaded script on collection 68 to 1610 for the name. This fixed the issue I was experiencing also! Thanks Keith for catching this. Noticed the collection for 1606 clients was not working and the criteria is looking for client version 5.00.8412.1006. That should be 1007, right? The “All Windows Update Agent Version Outdated – Win7 RTM and lower” collection is picking up all my Windows 10 workstations for some reason?? I’ll add Windows 10 to the script today. It appears that some versions and editions of Windows 10, such as the Windows 10 Enterprise LTSB, do not follow the traditional naming convention. This affections Collections 8, 13, and 45. From my testing using “where OperatingSystemNameandVersion like ‘%Workstation 10.0%’ or OperatingSystemNameandVersion like ‘%Windows 10%'” should get all over the flavors. P.S. I haven’t tested Windows 10 mobile yet. Thanks for sharing this very useful tool!!! OK, I know already, we must change refresh type (-RefreshType 6). How to enable option to use incremental updates for this collection in your scripts? it's too bad we didn't have "Warp Factor 20" technology now — then we could all leave this earth behind to the lieberals and the islamonazis they seem to admire.